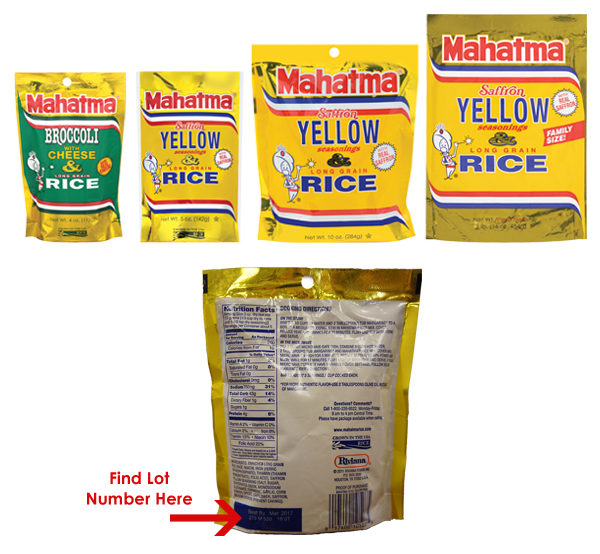 Riviana is voluntarily recalling approximately 16,943 cases of certain coded Mahatma® Yellow Rice and Mahatma® Broccoli & Cheese Rice product, due to the possibility that some packages may contain grey metallic dust particles. The products at issue were manufactured at Riviana’s facility in Memphis, Tennessee from December 27, 2016 until February 3, 2017 and were distributed in the U.S.
• 12-pack Mahatma Broccoli & Cheese Rice 4oz. The product at issue can be identified by the manufacturing code and UPC number listed on the back of the package as listed in the chart below. No other sizes, varieties and no other packaging arrangements are included in this recall. At the time, Riviana has received two consumer communications about the affected product within these code dates but no reports of illness or injury associated with this product. Riviana is instructing distributors and retailers to segregate the recalled products from their inventories so that a Riviana Foods Inc. sales representative may assist retailers in the disposition of the product. Consumers should return the affected product to the store where they purchased it for a full refund. Consumers who may have questions or concerns should call Riviana’s toll free Consumer Relations number at 1-800-226-9522 between 9 am and 5 pm (Eastern).